In late 2007 Adobe began providing sneak peeks at a nascent technology from the Adobe test labs. Code name “Thermo,” this new technology promised to allow designers to rapidly create and prototype interactive Web sites and Web applications without the need for coding. Once the design of the site was completed, they could hand off the project to a coder who would integrate the site design with the databases and back-end programming. Although it has taken several years, Thermo has now emerged into the world as Flash Catalyst, a new addition to the Creative Suite. It is a remarkable new tool which simplifies the design, development and distribution of Flash sites, Web applications and AIR applications. Inside Flash Catalyst, selecting individual layers allows you to convert them to components for your Web application. For example, selecting a text layer brings up the Component Heads-up display (HUD). 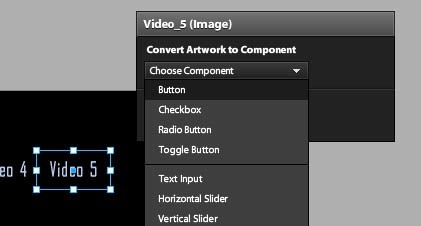 Selecting Button from the Convert Artwork To Component pull-down menu automatically converts the text layer to an active button and creates each of the Up, Down, Over and Disabled states to make the button functional. Once the button is created, selecting Add Interaction from the Interaction panel allows you to control what task you’d like the button to perform when clicked. 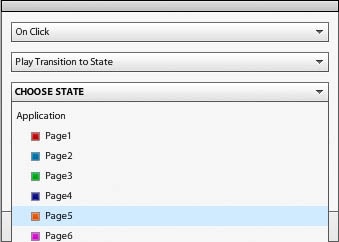 In the screenshot, I’ve specified the button jump to page 5 of the document. Without any coding or programming knowledge, I’ve created an interactive document. Simple, Flash-based microsites can be created entirely within Flash Catalyst without any need for additional coding. If you’re working on a more complex application, one that interacts with a database, for example, you can design your web application adding preliminary controls and interactivity, then hand off the FXG file to your programmer who can open your design in Adobe Flash Builder (formerly Flex) to complete the code. Flash Catalyst brings Flash design and publishing capability to designers who are intimidated by, or just don’t have time to learn, ActionScript. Ultimately, the success of Flash Catalyst is tied to the future of the Flash publishing platform, which a year ago seemed unstoppable, but with Flash being shunned on the iPad and Apple’s blocking of Flash Professional’s iPhone packager, many designers are hesitant to develop new Flash sites given they cannot be accessed by an important section of their audience.